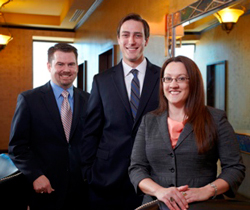 ScottHulse law firm has expanded the professional staff in its El Paso, Texas and Las Cruces, New Mexico offices with the addition of three new associate attorneys: Joshua Dwyer, Miranda Barton and James Feuille. Mr. Dwyer, who is based in Las Cruces, assists ScottHulse clients with estate planning, probate, estate and trust administration, and business related legal matters. An active member in the Las Cruces civic and charitable community, Mr. Dwyer serves on the board of directors of Mesilla Valley Hospice and is a member of the Rio Grande Rotary Club. Ms. Barton joins the firm’s corporate and securities, lending and financial institutions, farm and ranch, and real estate sections in El Paso. She earned her Doctor of Jurisprudence degree at Southern Methodist University Dedman School of Law. A life-long El Pasoan, Mr. Feuille works in the firm’s commercial litigation, construction law, creditor’s rights, bankruptcy and restructuring, labor and employment, and education practice groups. Mr. Feuille earned his Doctor of Jurisprudence degree at University of Texas at Austin School of Law.